Buffon was born on September 7, 1707, in Montbard, France, to an aristocratic family. He completed a law degree in 1726 and then studied medicine, botany, and mathematics at Angers. When his mother died in 1732, he returned to his family estate in Montbard, where he lived for the rest of his life. 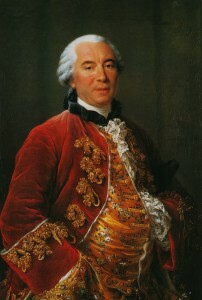 Buffon’s generous inheritance allowed him to pursue his interest in the sciences, particularly mathematics and botany. He conducted studies in probability theory; and he also translated several works into French: a botanical treatise, Vegetable Staticks by Stephen Hale, in 1735; and a mathematical work called Fluxions by ISAAC NEWTON in 1740. In 1739 he was appointed keeper of Jardin du Roi, France’s royal botanical and zoological gardens, and was charged with creating a catalog of the gardens collection. He developed the project into aft attempt to describe the whole of nature. The result was Natural History, a series of 36 volumes published from 1749 through 1789. The work contained careful, detailed descriptions of biological and geological history accompanied by artistic illustrations. Natural History included Buffon’s non­theological views on the history of Earth and its inhabitants. He posited that Earth and the other planets were formed out of stellar fragments broken off the Sun by a comet’s collision. He claimed that Earth began as a molten body and gradually cooled to its present state, a process that he estimated to have taken at least 70,000 years. Buffon noted that variation exists within species, and he described the vestigial features of some animals. He later wrote that related animals have common ancestors, but he stopped short of positing that species evolve. Buffon became ill in 1785 and died in Paris on April 16, 1788. Buffon’s Natural History represented the first attempt to catalogue all of nature in a single publication, and the work provoked controversy as well as widespread interest in natural history. It also influenced the development of evolutionary theory. Natural History caused an uproar among theologians. Immediately following the book’s publication, religious authorities attacked Buffon for his non­biblical views. The Bible, in the book of Genesis, states that Earth was created by God and implies the event occurred about 6,000 years ago, whereas Buff on posited that a natural cosmic collision formed Earth and reasoned that Earth must be at least 70,000 years old. While his estimate of Earth’s age now seems vastly incorrect, compared to current estimates that date back to roughly 3.9 billion years ago (the age of the oldest rocks known to scientists), his estimate was one of the first to scientifically consider Earth’s history apart from calculations based on biblical considerations. The controversy was part of the gulf developing between science and religion in Europe during the Enlightenment.